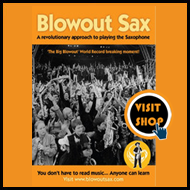 This part of the Blowout Sax site is to help and guide you to find high quality kit that does the job and is or has been used by saxophone greats, Blowout Sax’s Key Players and students. These can be saxes that play easily and produce a warm tone, we talk about upgrading the mouthpiece to enhance the production of your personal sound, groovy cases that also protect the instrument and very good sax stands that make you want to play and show off your beauty to your world. Blowout Sax created the first and now runs the foremost and greatest saxophone schools in the UK. As such we know the best quality products to buy. 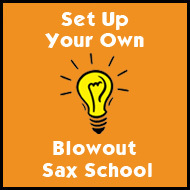 If you are just starting out on your own saxophone journey and want to learn with Blowout Sax then we can rent you a sax to get you started. Alternatively, if you are ready to buy your very own first sax or are thinking of buying one as a present for a beginner then we recommend and sell the Trevor James ‘Classic’. Other recommended makes we’ve seen here at Blowout Sax are the Earlhams – for more details have a look at our Beginners’ saxes area. All of the saxes recommended at Blowout Sax are chosen for certain key features. Firstly, they all have big big big tone. Second, all saxes are well crafted with good solid action. Thirdly, they play in tune! And finally, they must represent solid value for money. 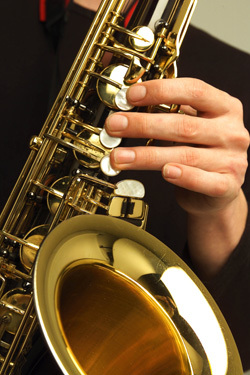 Check out our Buying a sax guide for more detail. As you move on through your journey, or you may already be an experienced player, you will need and want more things to improve your saxophone experience. Have a look at our personal recommendations from reeds to US vintage saxes to top Professional saxophones. 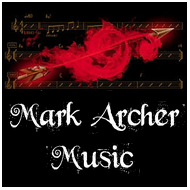 The top recommended retail outlet that are used to dealing with all standards of saxophonists from beginner to pro are www.sax.co.uk for saxes and accessories. Don’t forget to Look after your beauty, following our helpful maintenance guide and if things do go wrong, we know the very best technician - Ray Colomb – www.raycolomb.co.uk for very best display of repairing knowledge and skills. We are also interested in buying or selling on a commission basis any Saxophone or Mouthpiece, regardless of make, model or condition. Just give us a call or pop us an email with a photo.